I continued adventuring in Mirkwood, assisting the Malledhrim at Echad Sirion. 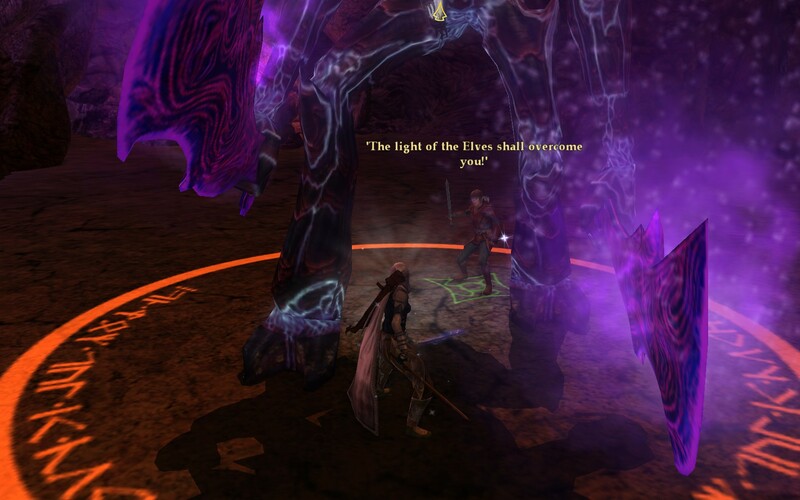 But I was called away to a secret mission: to assist the Hidden Guard bring Mazog to Dol Guldur. We were attacked a few times, but easily repelled the enemy. Unfortunately, tragedy struck and Raddir fell. No one knows how or what happened, but all of us suspect Mazog had a hand in it, even though he was under our watch the entire time. As of now, he sits in a jail cell beneath the Haunted Inn in Audaghaim. Meanwhile, I helped Dúndurion with an attack on a nearby ruins occupied by merrevail: Dannenglor. But first, I had to go do my skirmish training. 😉 By using the GoTV and skipping to level 50, I completely forgot about skirmishes. Yeah, there was probably a popup notification, but I probably dismissed it and then forgot to visit a skirmish camp, despite riding right by the one at Echad Andestel dozens of times! The training went well, and jiggled my memory about what to do. For AutumnTian, I chose a herbalist soldier. I think Naerys has a Sage and Dhrun has an Archer. Speaking of Naerys and Dhrun, they are feeling neglected but I really want to get Autumn through Mirkwood before making the push to max level for Naerys and Dhrun. I spent a good 30 mins on one mission of the business tutorial – Balancing the Books 4. The mission was straightforward: fly to the given location, take out any pirates (a single ship), then use a Civilian Data Analyzer to get the goodies. The writeup didn’t say what would happen next. I was expecting the Analyzer to crunch away for a bit, and then result in an item I would “open cargo” on to scoop up whatever was inside. Instead, I got a little hacking mini-game. The UI displayed a hex grid which mapped the nodes of the computer system you were attempting to hack. Nodes adjacent to the starting point were the only ones clickable, and clicking would reveal each “encrypted node” as empty, containing defense (a firewall), or the system node (the target of the hack). For the firewall or system node, I just had to click more to wear down the resistance of that node – or fail as I did half the time with the system node. In that case, I’d get the message “system core is too complex for you to get anything of value”. If this happened, I could try again after a few seconds, from a brand new layout. I can already imagine more advanced modules and skills involved to hack into fancier system with more valuable loot, but this was part of a tutorial so the nodes were easily revealed and the node types were limited. But I couldn’t figure out how to complete it, even after a successful hack. I was expecting an “open cargo” button to show up, but that didn’t happen. I read the details of the mission over, and it said that on a successful attempt, the data core/chip would be ejected. But I didn’t see that either. I fiddled with my overview, tried a few things but got nowhere. Finally, I rotated my view a bit, and after another success I noticed some gas clouds – the lower right of the following screenshot. I noticed a small canister floating away, one that didn’t appear in my overview. I tried to click but it vanished too soon. So I tried again and this time was quicker and able to approach the item before it disappeared. No “open cargo” button so I tried again and just ran into it when it vanished… I checked my cargo and I had 2 of the items, so I guess the previous attempt also worked. Anyway, I was able to finish the mission, but it left me a bit irritated. First, unlike so many other times in the game, where you loot something by targeting/approaching it and doing an “open cargo” and “loot all”, this apparently involved ramming the item or just getting close enough to grab it without any notification that it happened. Second, the item I was supposed to catch did not appear on my overview, at least with the various default settings including “all”. Third, the item was time sensitive and vanishes in seconds. I think I was too close and facing the wrong way earlier so I missed seeing the container eject and drift away. Here I have the Data Storage Container targeted (what I used the data analyzer on), and the Data Container itself selected (I clicked “approach” since there wasn’t much else to do with it). Fortunately, I was able to use what I learned here a few missions later. 🙂 I was sent out to do a similar task, with a Relic Analyzer instead of a Data Analyzer. 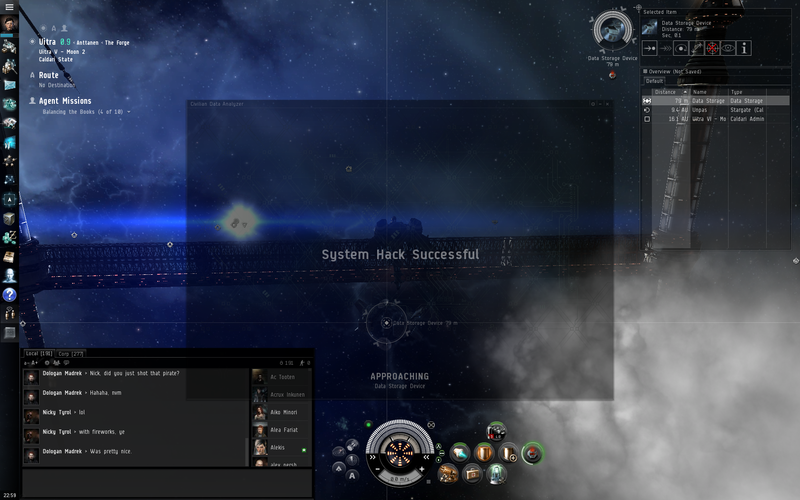 When I was close to hacking the system core, I zoomed out and watched for an ejected item. When I approached it, my ship’s cargo button (looks like a bolt in the ship control panel) shimmered a few times. This time I collected the item with no issues. I think this tutorial could be improved. The least I would do is make the container show on the overview (give specific directions on what to check in order to see it – in other missions, the instructions say to be sure “large collideable object” is enabled, so something similar here) and present a more obvious notification (besides the cargo button animation) that the item was captured. Even better would be to make it like everything else a newbie sees up to this point: the “open cargo”/”loot all” method of getting the item. Or, specifically mention picking this item up works differently: it is time sensitive so approach it quickly but you just need to get close and not open/loot it. After I wrote this and scheduled the post, I saw Sugar Kyle’s post where she gives some great info about exploration. It appears the “scatter canister” not appearing on the overview was the design, to encourage grouping, and that players don’t like it and it will be removed! Interesting… we shall see what changes are coming. For the record, I don’t think it is terrible, I just think that a newbie would be confused and so if it remains as-is, the tutorial should really highlight the mechanics. I generally log my characters off in Lion’s Arch, near the bank. 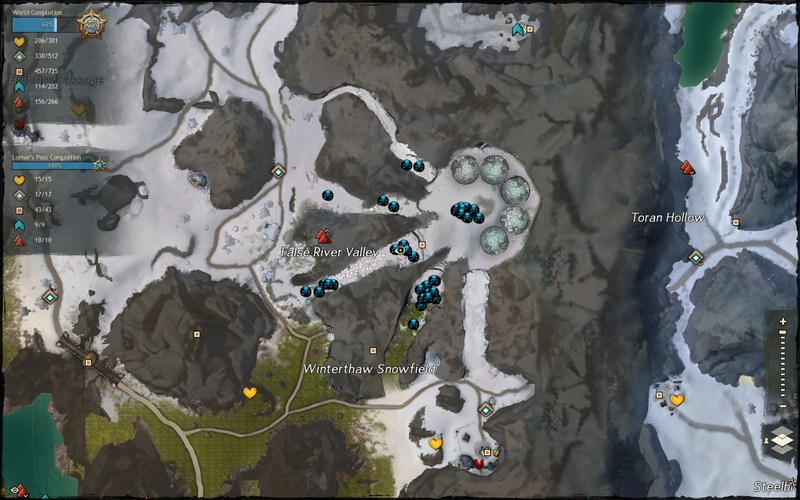 Crafting is nearby, Black Lion trading is nearby, and Lion’s Arch is itself centrally located with a hub of Asura gates. I think lots of other players do this too, because it is always busier than any of the other cities. 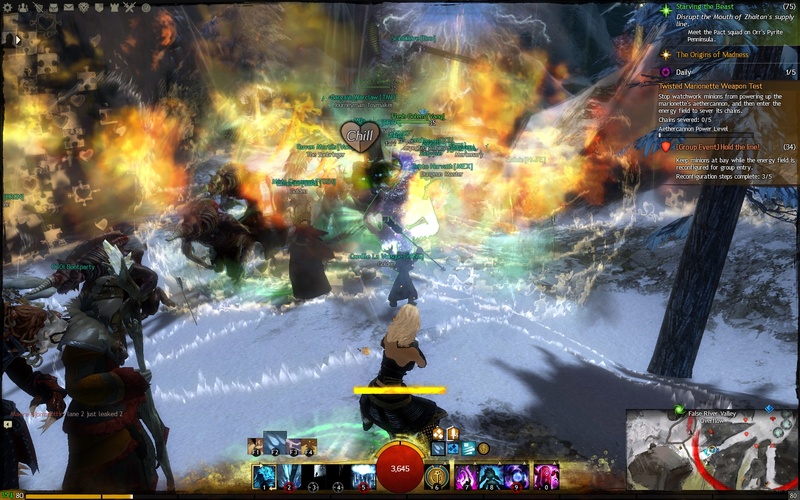 In turn, ArenaNet decided to spice things up a bit by making Scarlet Briar, current übervillain, attack Lion’s Arch with her forces. So it was that I logged in to move my characters, either to their racial city (for characters I’m not playing a lot at the moment) or the nearby Order refugee camp. Basically I moved Aurora to Lornar’s Pass and the Durmand Priory area, Glyneth to Vigil HQ, Cargus my engineer to Rata Sum since I’m not playing that char too much, and Summer my mesmer to the Grove. I actually play Summer now and then, but for the moment I’m leveling Glyneth to 80 and then I’ll probably resume leveling Summer – currently 40ish. Anyway, each char logged in to a raging battle right on top of them. It was fun actually. And once again I was reminded how fragile Aurora (an elementalist) is. 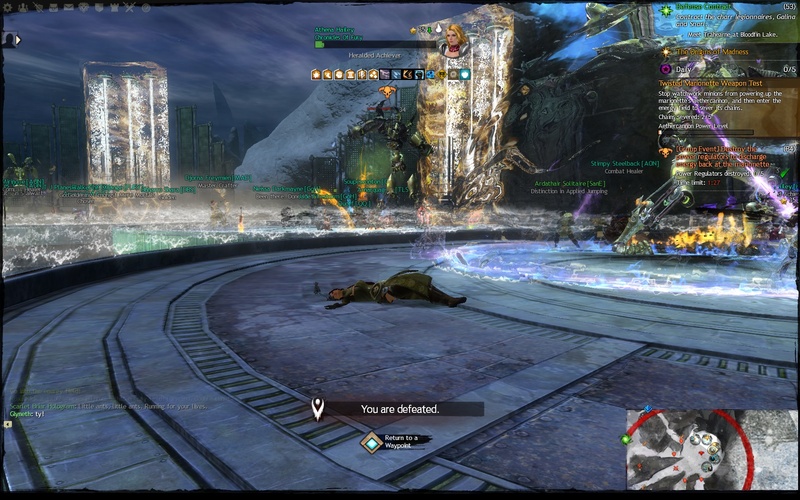 Of all my chars that stayed and fought from the time logged in with a bit a zerg fun added after that, the only one that died was her. 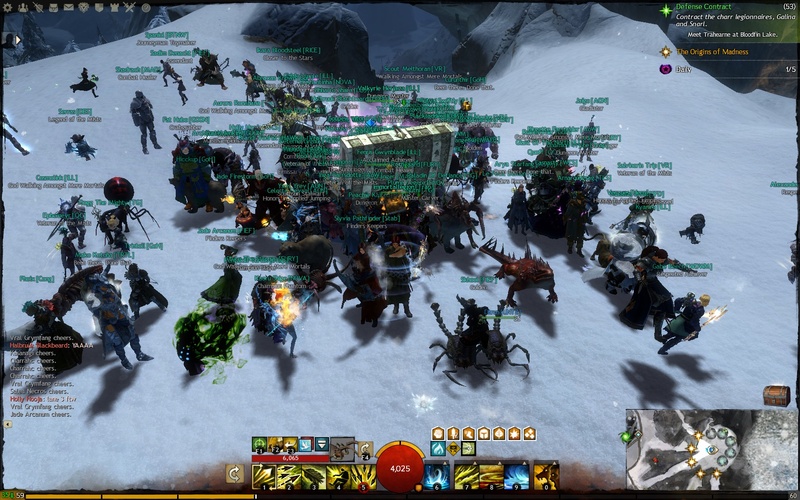 Anyway, now that everyone is repositioned I’ll check out the Lion’s Arch content later. Something about battling miasma and rescuing citizens. I have specific goals this time around, which are: exploration. I find the Tiger Ears blog to be interesting, so my goal is to work up to that. Well OK, probably not all the stuff she does… baby steps, doing plain old exploration in safer areas first. Another possibility is joining a corporation. One that looks interesting/appealing is Foo Signature Industries. A commenter left a note about them earlier, and over time I might train up the skills they suggest and get in touch. I decided to reactivate my original account from 2008-2010, since that character has more skills points. My newer account is full of Planetary Interaction “experts” (well, at least they have skill training) and I’m going to basically avoid that, in hisec at least. It wasn’t worth the time put into it, even though it was enjoyable. I also decided to redo the tutorials, and I’m glad I did. They’ve been updated to cover new UI elements, like the radial menu, the “loot all” button (when opening another cargo bay, now you don’t have to drag into your ship’s cargo bay) and other improvements as well. I will obviously redo the exploration tutorial, and perhaps the industry one, and then figure out what to do next. One word of caution – read/follow the directions carefully! One tutorial sent me out with a weapon but no ammo. I was furious, wondering how that could slip by testing. But I was skipping ahead. 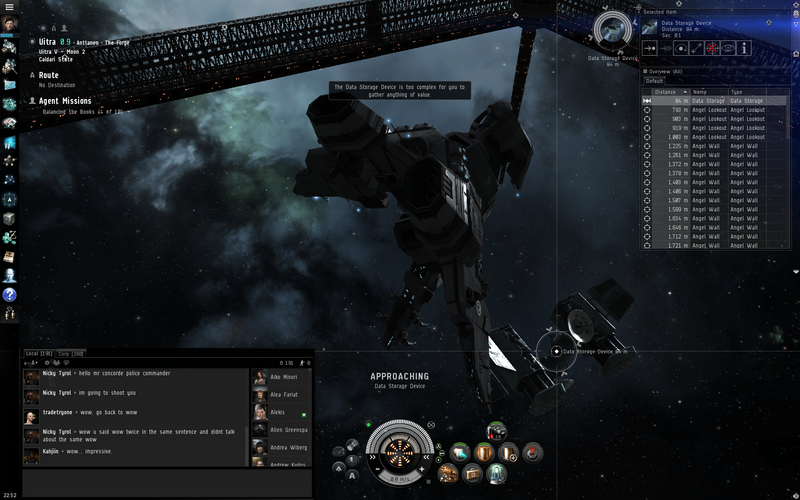 I read the tutorial popup closer, and Aura said she would create the ammo in my cargo hold once I clicked “next”. Aha! 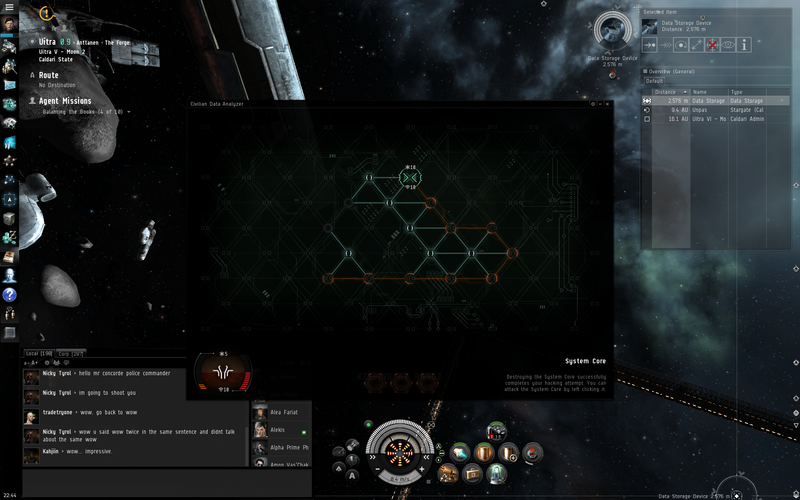 This is one of those times where a little knowledge caused me temporary grief – if I knew nothing, I would have read the tutorial and followed it lock step (“click next when undocked”, “click next after warping to the acceleration gate”, “click next and I will create ammo”, etc.) But I knew how to get to the acceleration gate so I moved ahead of the tutorial and then was puzzled how I was supposed to blow up the fuel depot. What about ISK and the difficulty I had before getting a dependable income (that is fun to earn)? 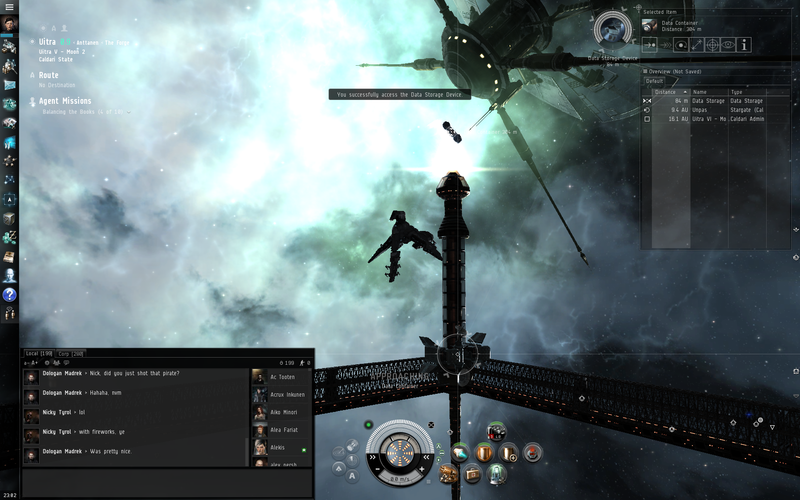 Well… honestly, I’m going to redo the Sisters of Eve epic, since as I recall it paid about 10 million ISK or so. That’ll buy a few skill books to start me out with again. And I’m willing to buy/sell a PLEX to seed my initial forays for a bit. 600 million ISK will definitely covers a lot of modules, ships, skillbooks, and at least get me actually doing stuff I want to rather than grinding some super boring mining or station trading to make enough money to undock without fear of losing a ship. I wrapped up Vol 2 Book 8 on Autumn Tian, which required assisting Magor in Azanarukâr. 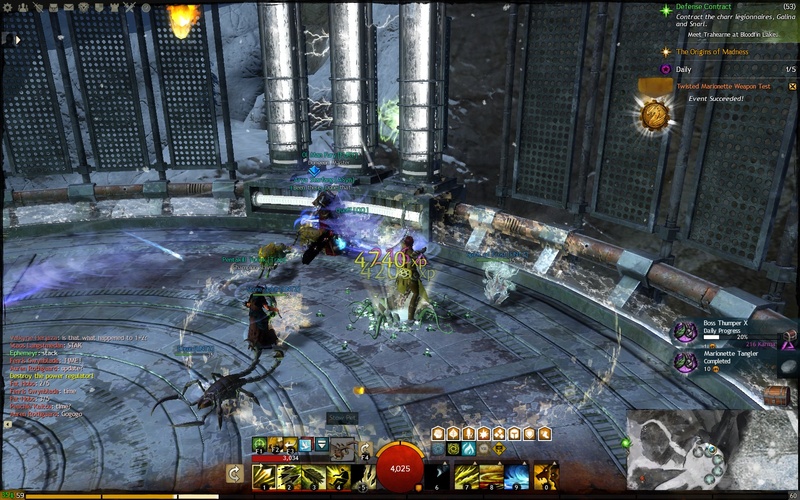 Even though I had destroyed 2 previous relics of Gorothúl, we were investigating a possible 3rd. We returned to Gwathrendath victorious, and spoke to Lenglammel before she sent me to speak to Haldir. He in turn mentioned that the Golden Host was moving into Mirkwood and also scouting for an indirect path to bring Mazog there, and my help would be welcome. So I boarded a boat to Mirkwood and found myself across the Anduin river, in Echad Sirion. 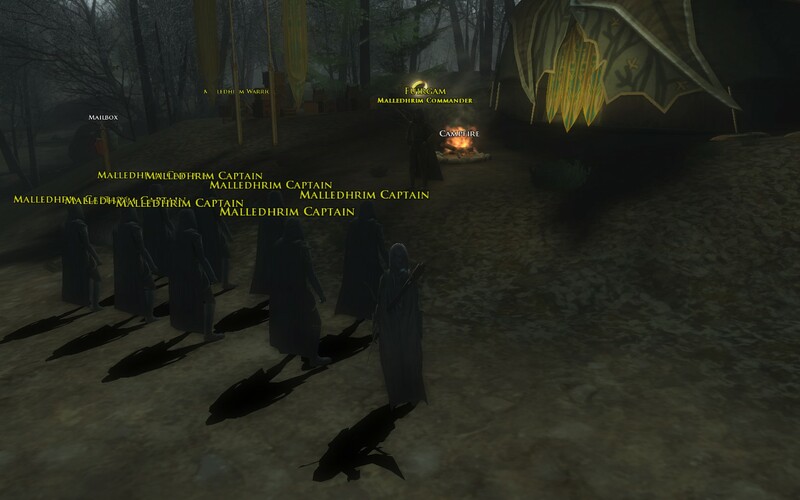 I lined up with the rest of the Malledhrim, but I was tired and snuck away to rest. I will speak to Fuirgam first thing after resting. 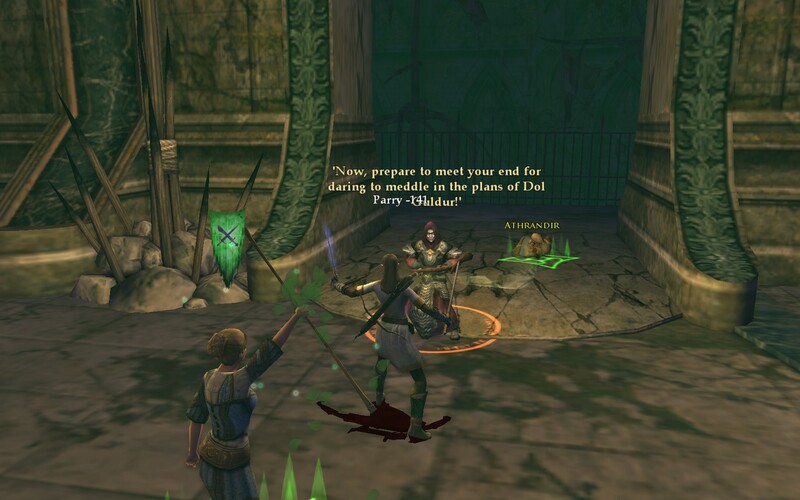 Before most of this happened, while adventuring in Moria, I received a blind invite to join an elf-only kinship. I figured what the heck, the message was polite, so I accepted. It’s a small kin, still growing and recruiting: Last of the Noldor. I think there were 3 or 4 others on, all lower level which is fine. I’m kinda hoping someone will ask for help on a quest or maybe a dungeon (Great Barrows?) and I can help out, hehe. Another goal of mine this year, besides actually splitting my time between MMOs better, is to be more social/active in the game. I have the tendency just to solo everything – granted the design of the modern crop of games makes that fairly easy to do. 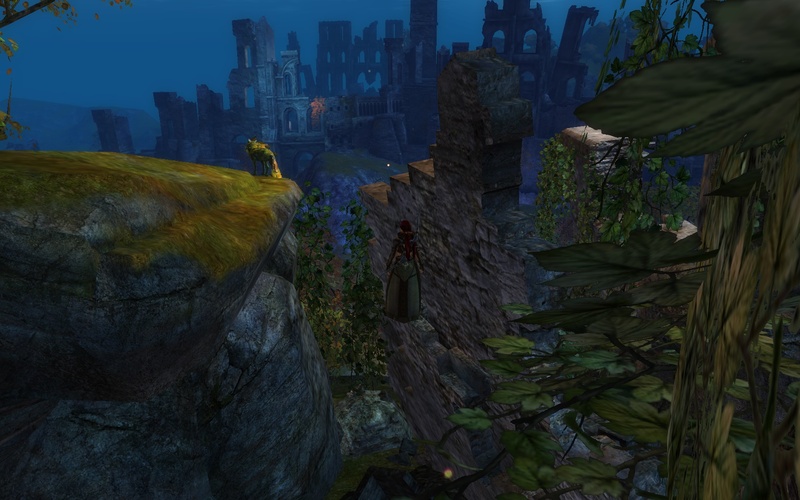 Author mmojugglerPosted on 2014/02/10 2014/02/11 Categories LoTROLeave a comment on LoTRO – To Mirkwood! PCGamer wrote an excellent article about this battle, read it! My first experience with this fight was rather mysterious: I was exploring Lornar’s Pass for map completion on my ranger Glyneth. 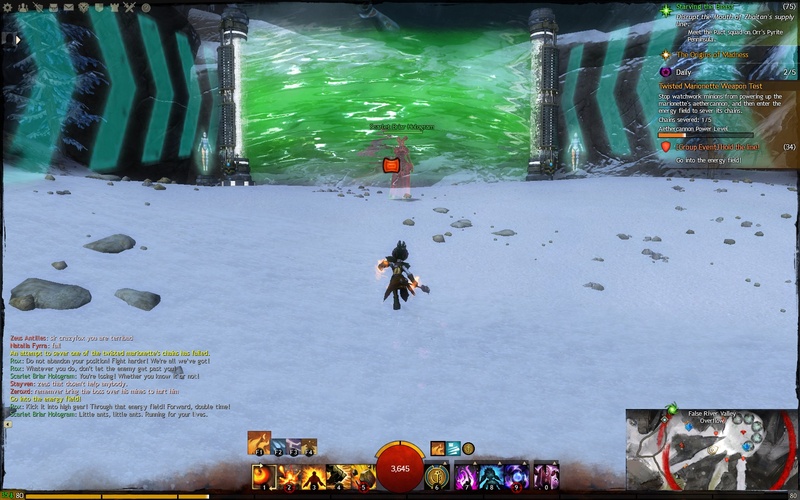 After reaching the vista north of the False River waypoint, I dropped down to mine some ore… and while doing that, a weird green beam surrounded me and suddenly I was defeated. WTF?! I wasn’t sure what to expect when I showed up… other than huge crowds! There was definitely excitement as dozens and dozens of other players staged. Lane 3 requested more people so I made my way there and waited for the countdown along with everyone else. My strategy was simple: cycle through attunements and cast whatever AOE’s weren’t on cooldown. And dodge. Eventually I was able to be a bit more sophisticated and start using water AOE’s (help heal other players), earth AOE’s at chokepoints (help cripple/slow enemies), my single air AOE (to stun), in addition to raining meteors as often as possible. I favored using my AOE’s since most are combo fields that would then let other players that use combo finishers to trigger a larger effect. This worked well and we triggered phase 2 of the right, so I ran towards the energy field. This is the part where each lane gets split into platforms and fights a Champion. Each one is different (see the guides) and involve a lot of positioning and dodging with some crazy fight pyrotechnics going on all around: sensory overload and fun in a very hectic way. My platform was able to do our part, which left us to cheer on the other platforms. Unfortunately it didn’t work out and we failed the event. Overall it was still a pretty fun time. 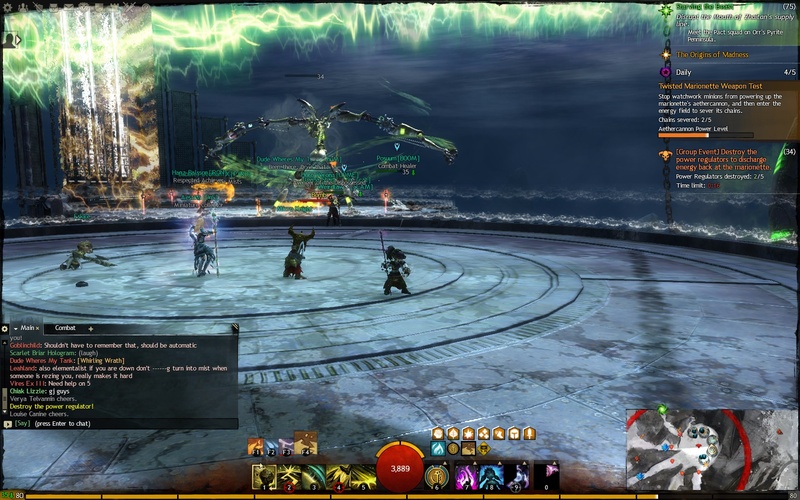 Quick to get to (False River Waypoint), ~30 mins of intense fighting and crazy boss mechanics, involvement of dozens (hundreds) of players, no elaborate or lengthy setup to participate. Good times. Later, I returned with Glyneth and gave this fight a try with a ranger. I put spirits down (frost and stone), healing spring on recharge, picked a ranged pet, and barraged/rapid fired as much as possible. We advanced to the Phase 2 platform portion where I eventually missed a dodge and fell. But the rest of my platform was OK so they kept on fighting our Champion… while I watched other platforms. Here is where I get fuzzy on what exactly happened. I think our lane was successful overall, and we exited out to resume the Phase 1 tower defense portion. 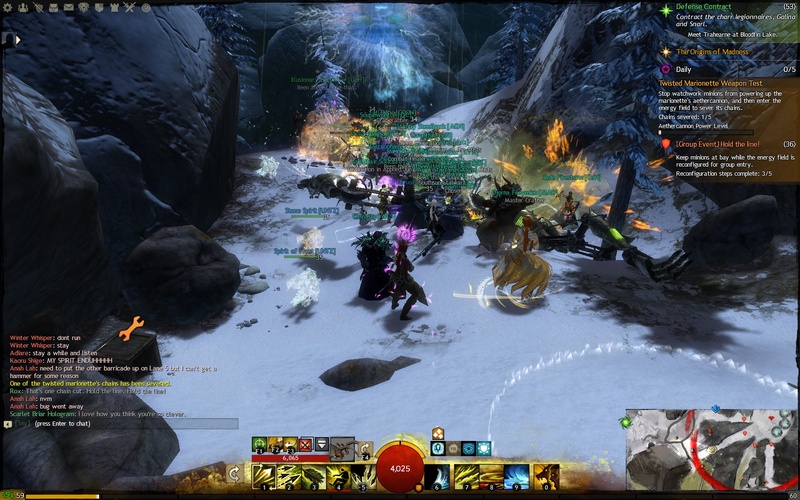 Somehow, we went back to the Phase 2 section again and fought, and this time at the end of destroying the Power Node, we saw that wonderful “Event Succeeded” message that sent the entire area cheering. We saw Scarlet’s Marionette collapse and then were rewarded with a gigantic chest. I’ve been back a few other times and so far, only participated in the one victory on my ranger. Looking for another, and having fun either way!